Bodybuilding and protein are mostly spoken in the same breath. A lot of bodybuilders eat large amounts of protein to supersize their muscle growth. The standard rule of protein consumption for muscle building enthusiasts is 1g of protein per pound of body weight each day. But, the bigger question is that how much of that protein is getting absorbed? Or, is getting flushed out of your system? A scary thought, isn't it, both for your money and bodybuilding dreams. Digestive enzymes are produced primarily in the pancreas and liver and released to help digest food coming from the stomach. Different types of digestive enzymes are critical for the breakdown and absorption of nutrients. The benefits of digestive enzymes are improved nutrient absorption rate of foods and relief from chronic gastrointestinal discomforts such as bloating, cramps and diarrhoea. Constituted of proteases, amylases, lactases, cellulases (not produced by the human body) and lipases, digestive enzymes improve the rate of absorption of whey protein. Protein is difficult to digest, therefore absorbing protein is more important than eating it. Protein digestion begins from the stomach and ends in the intestines. The pancreas gland secretes digestive enzymes to break down protein into easily absorbable amino acids, so that muscle cells can put them to good use. Now, if the body is not able to absorb protein, due to the lack of digestive enzymes, it continues to remain protein hungry, despite the fact, that you have eaten protein rich foods. Whey protein is a quick-acting protein source and it gets easily absorbed by the body. However, in the deficiency (genetic factors, stress, improper diet) of digestive enzymes, the bodybuilder is not able to use the whey to the fullest potential. The factors like stress, suboptimal diet and lack of digestive enzymes hinder the absorption of whey protein. 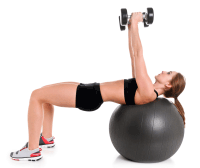 As a result, bloating and gassiness may also affect the fitness enthusiast. Besides, discomfort, the bloat factor is an indicator of poor absorption of whey protein. ARE YOU DRINKING INCOMPLETE WHEY PROTEIN? The benefits of digestive enzymes in bodybuilding are immense because for a bodybuilder premium nutrition is critical for building the muscles and digestive enzymes ensure just that. Digestive enzymes include proteases, lactase, cellulase, lipase and lactase. The bunch of these enzymes ensures superior absorption of proteins and other nutrients in the body to fuel muscle gains. The fact is that the whey protein remains in the intestines for only 1.5 hours. The protein content that is yet to be absorbed during the 1.5-hour window will be either stored as fat or excreted. In the best case scenario, the unabsorbed protein may provide energy. Another caveat in the whey protein absorption comes from the rate at which whey protein is absorbed: 8-10g in an hour. Hence, in 1.5 hours (the duration of whey protein in the intestines) at the max, only 15g whey protein will be utilized by your muscle cells. Rest of it will go down the drain. Rather, than merely increasing your protein intake, you need to increase the absorption rate of your protein shake. Herein, comes the role of digestive enzymes, as it significantly improves the rate of protein absorption, thereby helping you achieve your bodybuilding goal. The process of protein digestion starts in the stomach. In the small intestine digestive enzymes, attack protein further to break it down into amino acids, to facilitate its absorption. It is during this phase that presence of the extra digestive enzyme taken externally would help the body increase the pace of protein breakdown and absorption and take it above 8g per hour ceiling. To enhance protein digestion, you should avoid having water with your meals. Also, do not eat protein, if you had an antacid because an antacid will neutralize the acid content in your stomach. Since whey protein's transit time in the intestines is only 90 minutes, it really needs all the possible support from digestive enzymes produced by the body as well from external sources, to quickly digest and maximize the protein absorption. A July 2008 study published in the Journal of Sports Nutrition reported that it took subjects four hours to increase blood amino acids concentration by 30 percent with whey protein alone. However, mixing whey protein with digestive enzymes increased the absorption rate by 127 percent in the same timeframe. DigeZyme, a multi-enzyme complex consisting of gluten-free and GMO-free broad acting enzymes, including amylase, lactase, cellulase, lipase, and protease is the industry benchmark enzyme blend. 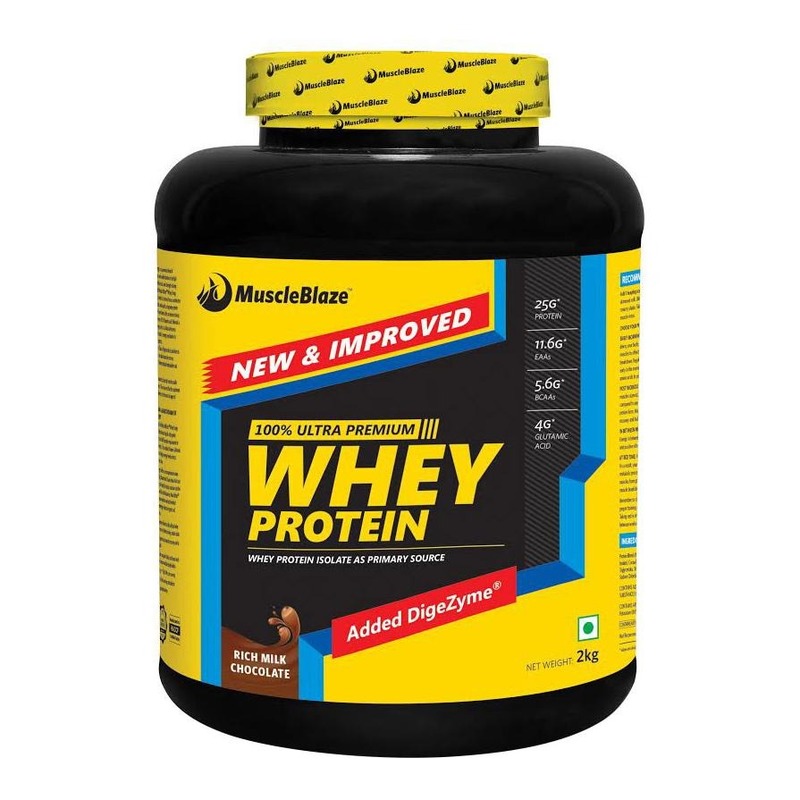 It delivers the most potent blend for digesting whey protein and also helps break down carbohydrates, lactose, cellulosic fibers, and fats as well. Additionally, it is resistant to the action of gastric juices, while retaining their digestive activity. So be sensible and stop drinking whey alone. 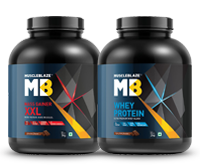 Choose a whey protein that contains DigeZyme, such as MuscleBlaze Whey Protein, because when you drink whey protein without DigeZyme you are not absorbing the maximum amount of protein possible from it. Certainly, not a happy situation to be in when you are trying to maximise the output of every ounce of your protein-rich food. Make your whey protein work as hard as you do. Choose MuscleBlaze Whey Protein with DigeZyme.